Something Delightful : Finally Found! You know that feeling you get when you find a certain item you've been in search of for so long? And then when the item arrives you decide that it's spot on what you've been looking for? 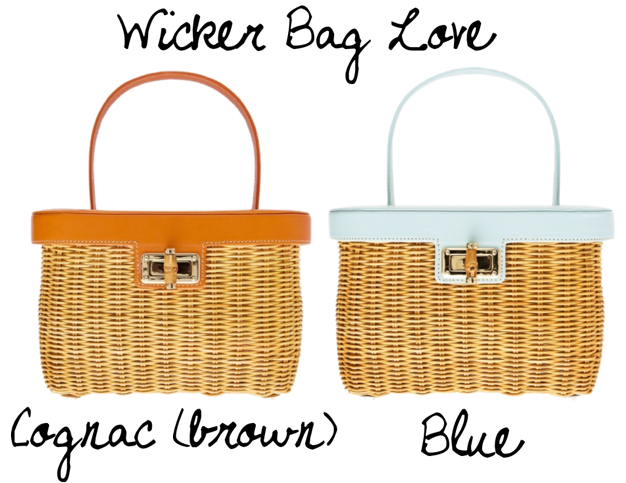 That's the way I feel about the Wicker Basket Handbag from J. McLaughlin! From the color, to the size, to the design inside, I couldn't be any more pleased. The best part…it's on sale! When I see this bag, I think of summer, picnics, Charleston, bike rides, etc. It's the perfect summer bag. If it were just a tad bit bigger, I'd carry Jaycee around in it. To top off the perfection of this piece, it has a bamboo accent to ensure enclosure. I have successfully found my Wicker Bag! I adore this bag ! Everything is just perfect, great wicker, bamboo clasp and it looks like the lining is super cute too. I adore my J. McLaughlin Wicker Bag too! I have the boxier one with the pink leather! Enjoy your bag!